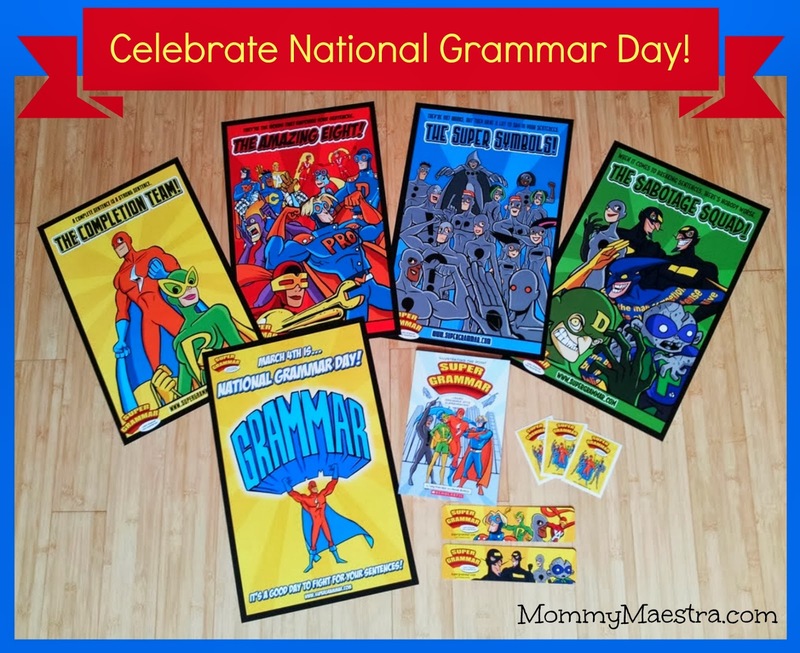 Mommy Maestra: Celebrate National Grammar Day with a Giveaway! I may or may not have been accused of being the "Grammar Police" on more than once occasion. So this is a topic that is very dear to me. It bothers me when I see there/their/they're being used incorrectly, or when my kids confuse an adjective for an adverb. (Yes, I know I have a problem.) That's why I love this giveaway. If your children (or even you or your spouse!) have trouble with grammar, it's no surprise given the dry, boring, painful way grammar is often taught in school. And that's why I love Super Grammar and have used it in our homeschool curriculum to teach my kids grammar - in a FUN way that is EASY to learn! You can read all about how I use Super Grammar in our lessons here. To celebrate National Grammar Day, our friends over at Super Grammar are donating a special prize pack of Super Grammar goodies for two (2!) MommyMaestra readers. The Prize Pack includes an autographed copy of Super Grammar, a set of four promo posters, and a National Grammar Day Poster (all shown above).